Or, just one… Robynn lost her first tooth! Here it is all gross and wiggly in her mouth on November 21st. On November 28, it finally came out! When Robynn was born, yes – when she was born – my Step-Mum gave her a cute little bear that would hold her teeth to give to the tooth fairy. It’s very cute – in it’s own little, hand-painted box, on a cloud of stuffing… well, Robynn finally got to make use of this little guy. She was very excited. This was Robynn the next morning… I just love my sleeping angel. She was really excited to see what the Tooth Fairy had left her (by the way, the going rate for a small little tooth is $2! ), and checking to see what she received got her out of bed quicker than most mornings! Jessica moved to Quebec to be with the love of her life and his family – but he’s in the Navy (yup, Canada has a Navy – had to look that one up! – but you would think with all this water, that we’d hear a little more about it – I digress…), so they may be back in BC before you know it. A few girls sent Jess off with a couple of drinks and lots of love the week before her departure. A couple of days before she left Lotus Land, Auntie Jessica had to come and see her girls. Here are some shots of that visit. Oh, and Happy Birthday Auntie Jessica. Here’s the video of Natasha scootching – just for you! ... Baby's got blue eyes (Elton John my friends). I'm going through my photos (there's a lot I haven't even looked at since taking them!). And this one was too good not to share. It was taken on November 10 - oh, I do make cute kids. Maybe I should make another one! 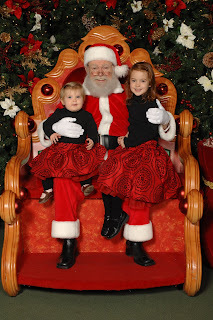 We made the trek to see Santa this morning - it wasn't nearly as eventful as last year! Were were in and out in less time than it took to drive to Coquitlam Centre. Robynn played shy. Natasha hammed it up. And we had a great shot. Have a good time coming to our house. I am going to have cookies and milk for you. I have been a good girl. I help my Mommy and I take good care of my sister. Thank you for bringing me Petshop toys last year. This Christmas I don't want any toys I just want love. Yup, she just wants LOVE!!!!!!!!! Wow, I have the best kid in the world!!!!!! I even took her to Toys R Us for an hour browsing the aisles looking for what she'd want. At one point she was thinking she might ask for a red Christmas ornament, but she wasn't set on that. Robynn put a lot of thought into what she was going to ask for this Christmas. She wants love. I love her! Now, if any of you have an idea how I can wrap up love, please let me know... I was thinking I might make her a scrapbook with her favourite pictures of family and friends. When she opens that, the charade of Santa may be up, but I'm ready for it. Okay, I've been wanting my blog to go in chronological order, but that just means I'm getting further and further behind. A wise person told me to start where I am, and when time permits, fill in the gaps... So that is what I'm going to do. Needless to say, the Reid household has been busy. And it's not likely to get any less so. I was asked by my principal if I'd be willing to work an extra day - that makes four days per week beginning in January. I did ask for this in the summer, so now that it's being offered, I can't turn it down. We are blessed to have grandparents willing to be with our girls for two of the four days I'll be at work, which makes it worth the effort. Hmm, not much more to say for now. I'll keep you posted, and fill in the blanks from September to now along the way. My Dad bought Natasha a present: a baby life jacket. These are relatively new, because nothing has been approved by the Canadian Coast Guard for babies. I’m not too sure that this one is, but it’s different from the regular jackets, because it’s supposed to keep babies up, even if they land on their front. Well, I tossed my daughter into the pool a couple of times – she wasn’t very impressed with me that’s for sure! But I felt she was safer having done some basic trials on my own. Robynn’s making sure everything is okay with her baby sister too! I feel very confident with Robynn in the water when she’s wearing her vest. She has some fun too, because she get’s to go out a little further away from Mommy’s reach. The next day, we went out on the boat. We were hit by a storm that roared through (on it’s way east, it also struck at a Jamboree, where there were many injuries and one death). This was a big storm. We were moored in a little bay at the north end of Glennifer lake enjoying a snack after our swim when the storm hit us. We watched the storm come towards us, thinking we were safe and that it wasn’t too big. We were wrong. Heather and I took the girls down below in and secured them in their jackets. Dad manned the tiller and motor – he was trying to keep us stable and away from shore. While Rick (a good sailing buddy of my parents) was at the ready to help out where needed. We were tied to Rick’s boat, but had to let it go for fear it would drag us or that the boats would knock together too harshly. Poor Rick watched his boat sail away across the lake – okay the wall of rain only let him watch it for so long. All in all, it wasn’t very long that we were in the storm, maybe 30 – 40 minutes. Dad asked me, later, how I was, and I told him, honestly, that I felt good about the situation. Heather and I had the girls, and Rick and he had the boat. Those men have a lot of sailing experience under their belts, and I felt who better then to weather a storm with than these two. Another reason I was assured was because Dad had purchased this life jacket for Natasha, and we had tested it out just the day before. Finally, I was praying for all I was worth while I was down below with my girls – praying for my father to have the strength to continue what he was doing; praying for Rick to be the best support person he could be; thankful that Heather was entertaining Robynn (Robynn was never really aware of the danger we were in –for which I am ever grateful); thankful that I was able to attend to Natasha – and thankful for my father purchasing the jacket she was wearing; praying for the safety of the other boaters on the lake that day; and praying that God would see us safely through this storm. He did. He answered all of those prayers. When the storm blew over, we retrieved Rick’s boat, and, thankfully, there was only a little cosmetic damage to the rudder. Then we made our way back to the trailer. We even made it out on the lake again later that week. We wanted there to be a very positive trip for Robynn (I think my Dad was more worried about me having a positive experience actually). I love my Dad, and I trust him and his sailing abilities. Was I scared, sure, but not really. Would I go out with my Dad again. You betcha! I’d even bring my girls on board. My regret: not getting any pictures of the awesomeness of that storm. It was truly something powerful to watch. Every summer, I try to head out past the glorious Rocky Mountains, to the rolling hills of Alberta. The girls and I spend a little time visiting with my family in Calgary, Airdrie, and, of course, up at the Carefree Resort on Gleniffer Lake. My Dad is a pretty good photographer, but every once in a while, he really nails the “money shot” – this one is it! And some shots are “memory shots.” These are both taken when the cousins, Hannah and Robynn, took Daddy/Uncle Mark and Grandpa Boat to the park. Of course the pool is always a big hit with Robynn – and we had the chance to introduce Natasha to the wonders of water while at Carefree! Robynn had to have a turn too! My little sister did it; I have to do it!!! Enjoying some time with Gpa Boat after a long first day in AB.